The synthesizer has spent much of its life in the background. Drummers get 20-minute solo spots and guitarists are all about the widdly bits. Hell, even bassists get a solo lick in now and then. And keyboardists? Well, they get to hold down the chords or play the comps over which their bandmates indulge themselves. This is especially true today. Much of electronic music is a desktop-bound process and not terribly conducive to riffing. It's hard to imagine an electronic musician jamming out a blistering ACID-loop solo. Still, rare occasions, keyboardists have been known to step up to the footlights for some heroic histrionics, and when that happens, we take notice. For better or worse. It's all too easy to side with the status quo, slagging off the synthesist who dares take his or her place in the spotlight, but these performers deserve our praise for putting both restraint and self-consciousness aside and giving their audiences a real show. Has there ever been a more bombastic band than Christian Vander's Magma? Not content with creating concept albums, Vander created an epic concept that sprawled across multiple albums. It even comes complete with its own invented language. It's heady stuff and no mistake. Fortunately, all of this high concept is tempered with some terrific playing. Case in point: the blazing Minimoog solo played by Benoit Wideman (following another keyboard solo by Emmanuel Borghi). Dream Theater's Jordan Rudess drags bombastic synth soloing kicking and screaming into the modern era with his wicked widdly on the Haken Continuum Fingerboard. Here it drives an equally cutting edge Roland V-Synth. Rudess has earned his place as a modern keyboard hero with his precise yet energetic performances. The rawk grimacing probably helps a bit, too. Well, we're sold, anyway. Savvy viewers will note the dangerous-looking and slightly Klingonese keytar hanging in the background. The man has no fear! Really, we could have listed virtually any Jan Hammer track, but he may have been at his best when jamming with guitarissimo Jeff Beck, as seen here. It takes some serious cajones to trade licks with a guitarist of Beck's considerable talents, but Hammer rises to the occasion with some blistering leads from his, yep, you guessed it, keytar. Check him out as he leans in for some classic rawk posturing at 3:09.
t's a back and forth interplay between two giants and the Czech master leaves us in no doubt at all that, for that night anyway, it really was Hammer Time. We're pretty sure that even Styx themselves would admit that they have had more than a few moments of bombast. During the reign of Dennis DeYoung (a seriously underrated keyboardist himself), they filled stadiums with some pretty heady concepts and flash playing. These days, they split front-man duties between founder James Young, classic Styx guitarist Tommy Shaw and Canadian prog rocker Lawrence Gowan, an entertaining performer who is no slouch behind the keys. The solo in the rockin' One With Everything has it all: speedy riffage, dramatic, arm-flailing flourishes and one of the coolest custom keyboard stands we've ever seen. Jazz Fusion was a hybrid of the technical and improvisational aspects of jazz with the pomp and circumstance of rock. Few were better at it than Herbie Hancock, and while it would have been pretty easy to list any number of performances of his hit Rockit, once we saw Herbie's mystical posturing over his ARP Oddie in this clip, we knew it was the one. We half expected the thing to levitate up off of the keyboard stand. As a bonus, his incredible Odyssey solo is preceded by a scorching Rhodes improv. Hojo also appeared in our keytar roundup, albeit as a contributor to a Grammy supergroup performance. Here he is, fronting a very '80s-looking band as they lay down a spectacularly funky version of Howard's biggest hit. Jones breaks with new wave's minimal approach when strapping on his keytar for a big, brash solo that could put more than a few guitarists to shame. It's almost enough to draw attention away from that massive mullet. Right from the start, Asia were all about bombast. After all, what could be more over-the-top than a supergroup made up of prog veterans? 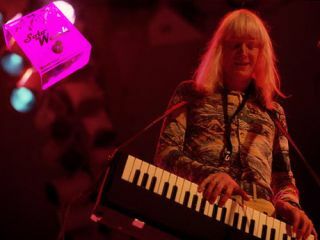 Keyboardist Geoff Downes' kit was equally portentous, with something like 20 'boards arranged as a horizontal wall, forcing the erstwhile Buggle to run to and fro to play his parts. Yet it's his solo on the rarely-seen strap-on Moog Liberation that earns his place on this list (you'll have to be patient - it doesn't get going until some eight minutes in). Joining guitarist Steve Howe and stand-in singer/bassist Greg Lake for a bit of synchronized bopping at the front of the stage, the solo is replete with pitch bends, portamento and much widdly. What do you get when you mix power metal, synths and video game music? We're not sure if it's a good idea either, but we're reasonably certain that it would sound very much like DragonForce. Keyboardist Vadim Pruzhanov is a head bangin' maniac onstage, bashing out frenetic solos on his Korg Triton or even, yep, his Roland Keytar. If Guitar Hero had existed back in those 8-bit Nintendo days, the solos might have sounded a lot like this. It's the epitome of the bombastic synthesizer solo. Equipped with an ARP 2600 (with a ridiculously long lead attached to the keyboard that he wore round his neck in these pre-keytar days), the multitalented Mr Winter blew everyone's head off with this monster riff. Not content with playing one of the most influential keyboard parts in rock history, the skinny sequined specter rips into a searing sax solo before having a go at the timbales. Astounding. For sheer bombast, it'd be hard to beat the wild flailing and live tweaking at about six minutes into this video. Back in the day, the word 'Emo' had only one meaning: Emerson. He was the fellow who single-handedly made keyboards cool for the brief time that they were cool. He did so on the strength of his chops, his energy and his unmatched theatrics. Whether he was plunging a knife into a Hammond after wrestling it to the stage, or scaling the rafters high above the audience's heads, the man knew how to put on a show. And then there was that Moog. The marvellous, monstrous bane of roadies everywhere, Keith's Moog Modular was one of the very few to grace the live stage. As if the sheer size of the Moog wasn't bombastic enough, Mr. Emerson called in the use of an attached ribbon controller, itself often loaded with fireworks! Now, if only he'd had the cape, he'd have topped our list! He may not have worn greasepaint or a cape and he didn't play light-speed solos, but Mr Dream Weaver himself earns runner-up status for chopping up not one, but two Minimoogs, painting them white, and hanging them around his (and guest player Steve Porcaro's) neck. And yes, there is a cowbell. Still, the allure of the tune can't be denied and the man helped define the Minimoog as the bass synthesizer for all time. Look Ma, no presets! Taken from a 1975 performance in Melbourne, this clip defines bombastic prog at its finest. Two Minimoogs (one for each hand! ), live tweaking, and yes, a cape. Hell, he probably couldn't have avoided the cape, looking as he does as if he stepped right out of an illustrated edition of The Lord of the Rings. Surrounded by keyboards (none of which are ignored), this is big, brash and as fast as lightening, but not without a sublime moment or two (five minutes in). Brilliant stuff.